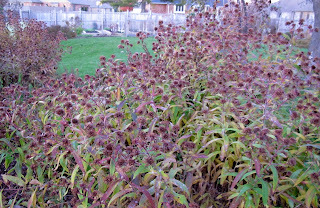 Welcome to Garden Bloggers' Bloom Day for November 2012. Here in my USDA Hardiness Zone 6a garden in central Indiana, we've had more than one killing frost so outdoor blooms are scarce and most of the leaves have fallen from the trees. In the lawn, a few volunteer violas, seedlings of violas planted last spring or earlier, are blooming. They seem to be oblivious to the frost, the grass around them and the occasional mower blade that is set just high enough to avoid cutting them off. They make me want to buy up packets of viola seeds and cast them about the lawn to see if more will show up. Elsewhere in the garden, the asters, which in past years were still showing a bit of color in mid-November, are completely brown now. I should really cut these down now, or by spring time I will have thousands of aster seedlings throughout the garden. 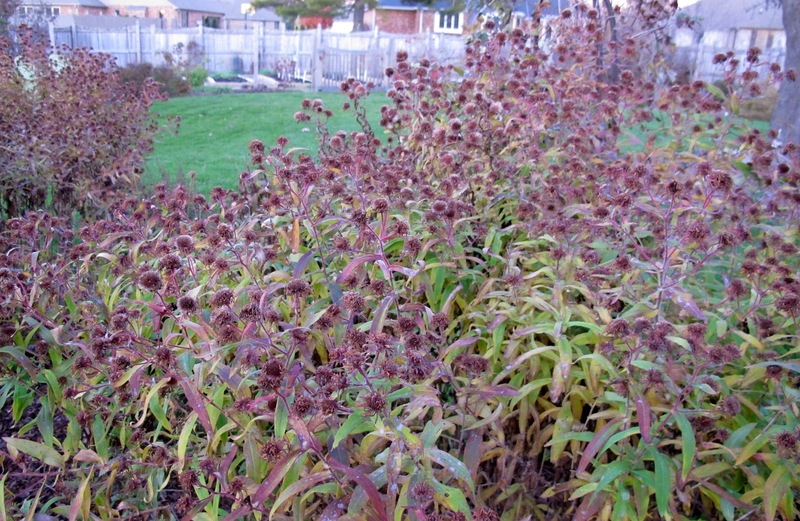 I'm less concerned about tall sedums self-sowing so I'll leave these seed heads standing for the winter. We like to tell ourselves that these dried up flowers look good with tufts of snow on them in the winter-time. You might think that there will be no more blooms in my garden until spring. That used to be true, but now I have Helleborus niger growing in my garden. It is known to many as the Christmas Rose because it blooms through the wintertime. It already has at least one bud on it, giving me hope that I and my garden won't be bloomless until spring. Inside where it is warm, the Thanksgiving cactus is poised to bloom. It should be in full bloom right on schedule for Thanksgiving, one week from today. How's your garden blooming on this mid-November day? We would love to have you join in for Garden Bloggers’ Bloom Day and tell us all about what is blooming in your garden on the 15th of the month. Just post on your blog about what is blooming in your garden on the 15th of the month and leave a comment below to tell us what you have waiting for us to see so we can pay you a virtual visit. Then put your name and the url to your post on the Mr. Linky widget below to make it easy to find you. I do things the plants in winter look better with snow. Perhaps that is why I like snow so much. Your cactus is blooming nicely. Mine just began to bloom. Thank you for hosting. Thanks for hosting GBBD again! Our gardens also had our first frost last week, but tucked under foliage a few blooms remained. 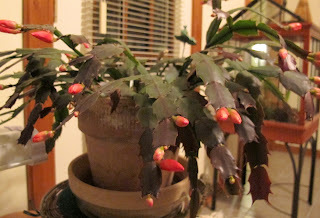 Your Christmas cactus is ready to burst with blooms--mine just opened two flowers yesterday! Happy GBBD to you! 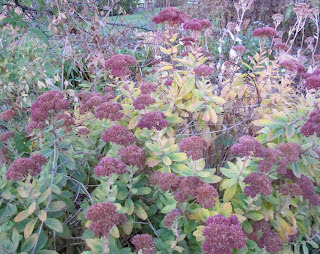 You still have some nice color going on in your garden even after the frost with your sedum and violas. Winter is quickly approaching here as well so we are holding onto the last of color. Thank you for hosting and a happy GBBD to you! I leave the plants up in winter for the reason you and Sage Butterfly likes them. They look great in snow, and the birds get a little food too. I am here for the first time and say: "Happy Bloggers Bloom Day from Austria." We also had a very early killing frost, so there are not many flowers left - but enough to fight the beginning winter depression. I love the idea of the GBBD, thanks for inventing it! We're still waiting for that first frost in Austin and I hope it waits a little longer. Your Thanksgiving cactus looks wonderful! You do have the magic touch... mine don't have any buds. I've got a GBBD post with a brand new song on the main page... the botanical list at Annie's Addendum. The blue clerodendron is the star this month. I nver apprecated how many flowers we have in the winter until I started to photograph them. This is such a great idea! That viola's very cute. I love how they pop up in random places, and all the colour combinations they come up with! I'll have to keep the house plants in month for Decemnber :). Happy Bloom Day! My hellebores are at a similar stage to yours Carol over here in Scotland. Happy GBBD! Thanks for hosting! Tried kaleidoscopes from image this month. Happy November to you. We are in the thick of fall color right now and no frosts or freezes, yet. Whenever they do show their cold heads around here, we southerners are always surprised even if it is expected. Thank you again for hosting. Fall is my favorite time of year and I admire the fall bloomers for surviving our drastic summers. Gosh the year is flying past. I have a Christmas Cactus that is in full flower at the moment, it obviously doesnt know when Christmas is. Strange that your Thanksgiving Cactus is coming into flower at the same time as its bigger cousin, my epiphyllum, is on the other side of the world. Happy GBBD. Thanks for hosting this! lOve seeing what's blooming in other bloggers gardens. Happy GBBD everyone! Your Thanksgiving cactus is beautiful. 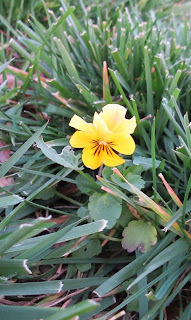 That little viola in your lawn is such a little gem; Ican see why you want more. We had a night temperature of 30 degrees a few days ago but there weren't frost crystals on the plants. Some of the begonias/impatiens are mush but others are just fine and most of the plants didn't seem to notice. My scabiosa is still blooming in Indianapolis. One of my cactus started blooming early, so it's done. I'm waiting for the other one to begin. Unfortunately, my dendrobium has not set any flowerstocks. Last year and the previous year, it was in full bloom at Thanksgivin g.
Carol, I love your idea for sowing viola seeds in the lawn. Thanks as always for hosting GBBD! Hi Carol. Hope you're doing well. Enjoyed the update on your garden! My Lenten Roses aren't setting buds as yet. How exciting to find some budding. I will have to go take a closer look. Maybe mine are just buried under leaves. I like the idea of just scattering seeds of violas in the lawn. I will have to try that. Happy GBBD. I enjoy following your blog, and today I have joined in the GBBD for thefirst time. Very nice, even with your fall / winter further along than here. Happy Garden Bloggers Bloom Day, from another sunny dawn in the SW! Your violas are so sweet. I think seeding them in the lawn is a great idea! I have planted helleborus, too, hoping to extend some blooms in my garden. No buds on mine yet, though! Thanks for hosting! 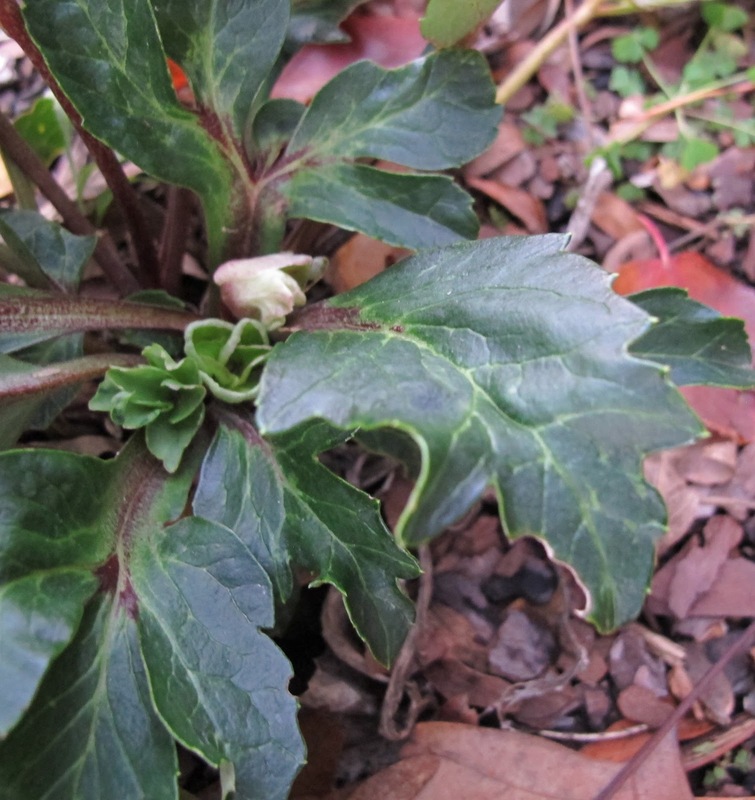 I have a bud on a Helleborus niger, too. I wasn't expecting any, since they all got moved this year. You should come on over and see my fall-blooming crocuses! Your indoor cactus looks fabulous. I wouldn't have a clue how to keep one looking that good indoors. Great gardening! Thanks for hosting Bloom Day! There is never enough time to record the beauty of the moment, but I have tried to leave us a record of a long and beautiful autumn, colorful trees, bare trees, views close up and from far away. So much beauty, so little time! God bless and Happy Thanksgiving! Roses in November - never fails to surprise me that they keep going well after summer is over. And the hebe just doesn't know when to stop. Thanks for hosting. And a great big thanks to my garden for a "job whale done" this year. Alas, the only blooms I have today is a tiny pot of white cyclamen that fell under a shelf outside that I found earlier this fall. Though totally neglected for months, it is now producing 4 (unphotographed) blooms. Love those sedums over the winter, Carol! It's nice to have the seed heads collecting snow, and I like them even bare. Your Thanksgiving cactus looks very promising! Ours is blooming right on time this year for a change. It seems to think it's a Christmas cactus! I'm envious of your Christmas Rose! Ours is pretty young, and so far it seems to prefer blooming in early spring. I was happy to see a few seedlings this year, and surprised they survived the drought - tough plants! Happy Bloom Day! Sorry for the double link, on the first one I accidently pasted in your URL instead of mine, and then Mr Linky wouldn't help me change it or remove it. Anyway...Happy November! I like what you said about "we like to tell ourselves" the seedheads look nice in the snow. I feel exactly the same way. Thanks again for hosting! Happy Bloom Day; thank You for hosting and Everybody for posting. Schlumbergera is my newest craze. Christmas Cacti all over the place and something I think I can pass off as Thanksgiving Cactus if it hurries. I think viola seed might rather have a nice little bed in which to be scattered along the edges rather than being tossed into the lawn. Thanks so much for hosting, we enjoy joining up with so many pretty gardens from all over! Thanks for hosting again this month, Carol! Thanks, Carol, and happy GBBD, all! Such a pretty viola - and lovely to have hellebore buds already. Our blooms are also scarce... Winter arrived in full glory last week. Snow and mid teen temps. But we have a few survivors.. and I found a few beauties to share! Thank you, Carol. I hate snow but with the state of my back garden at the moment I would love to hide it under a thick blanket of the stuff! Thanks for hosting. Only the lightest of frost so far here in Plymouth so I've got a bit more in flower than you. No matter, it's good to see any colour at this time of the year. Late again! But have a good excuse -- was at a Trees Matter" Conference all day. 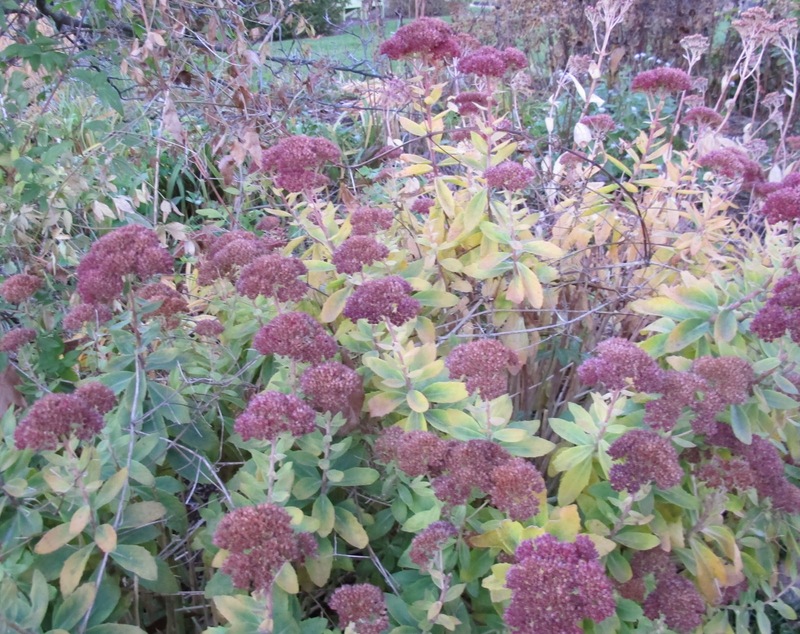 I too leave my sedum seedheads up all winter -- right now they are mostly pinks and burgyndy hues and will finally dry to russet browns. 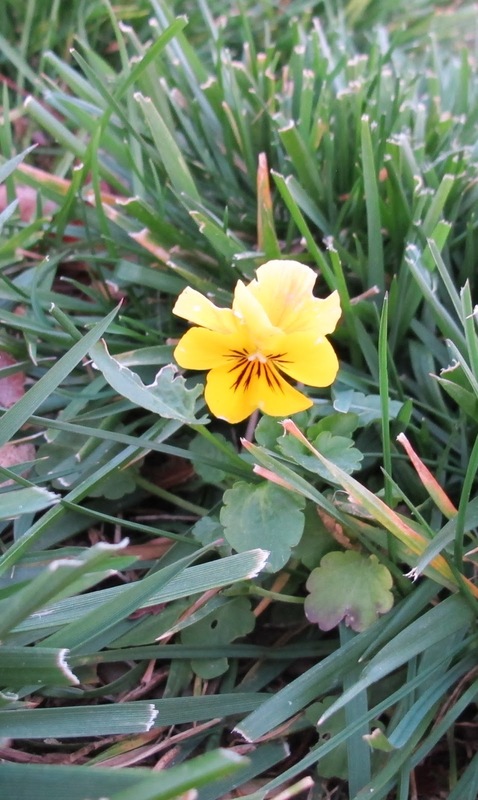 I applaud your willingness to let the Violas grow in the lawn. I find them charming. This November Bloom Day is rather disappointing, and I am glad to put the garden to bed and hope for a better season next year. I did manage to get a Bloom Day post done with some actual, outdoor blooms, but, as in your garden, they are few and paltry. Happy Bloom Day! I have mostly summer's leftovers blooming in my garden. We have had scant rain and have yet to have the first frost. So I'm still enjoying a few roses and clematis and other late bloomers. Too late in the day for me to visit properly now, so I will drop by again tomorrow. Thanks for hosting. Although this fall has not been the best for plants in the mid-Atlantic, my post highlights the go to plants that peak now. Isn't it funny how last year at this time, before we knew we were a half zone warmer, we had more color in the garden and fewer frosts? Anyway, I love your surprise viola! Thank you for hosting GBBD: outdoor blooms have dwindled in my upstate NY garden too but my Christmas Cactus is much further along than yours. I bought a yellow one in bud last week so maybe I can feature that next month. Bringin' up the rear here from the left coast ! I'm finally on time again! Love your viola in the lawn. Surprising number of blossoms in my yard this November. There are also blossoms on my Thanksgiving Cactus, but I'd have to call it an October to January Cactus. The first blooms usually emerge before Halloween. Those wither and fall off, and a second wave starts around Thanksgiving. A final round of flowers emerges near Christmas. There's an ugly heap of petals below the windowsill that I need to clean up before Thanksgiving. The violas are so cute, and so cheerful when the weather is cold. And I, too, love Thanksgiving cactus. Perfect timing on that. Congrats! Ah, seed heads do so count as blooms. I love your 'sea of spent asters'. I like the way the look and once snow arrives they will have little caps. Hi, Happy GGBD! Love the colours in your garden, Carol. This month I've posted about a Cape Town garden. Here in South Dakota along the Missouri River, the days are moderate and nights are cool. Few leaves are left on the deciduous trees but spruces, pines, and too abundant Eastern red cedar show up more. I like the subtle part of fall. Prairie grasses, displaying reds and golds are now dominant as last maple leaves fall. Carol, it is amazing the diversity of plant life on your and others blogs in mid November. I'm late posting, but I have a lovely surprise Camellia blooming. Thank you for hosting, Carol! I left my Thanksgiving cactus on the porch where it set buds and now i'm afraid to bring it in because I don't want the buds to drop from the heat in the house! It seems to like the cool fine, but I don't...will have to enjoy it from the kitchen window. Happy (belated) Bloom Day! Look at that hellebore bud! You really do have flowers all year-round, Carol; Elizabeth Lawrence would be proud. I'm a day late and am astonished & delighted that I found anything at all to contribute. I'm so glad I made the effort! Hi Carol, it's nice to be able to find something still blooming out there. Those Viola's are remarkably tough. My Tithonia finally bloomed in time for frost, I hope it hangs on a while. Carol, Thank you for Hosting... glad I found you and can share our Wake Forest, North Carolina Blooms! This is my first time and it took me a while figure out how to post. I love this day to enjoy the garden and use one of my favorite gardening tools - my camera. Happy belated Bloom Day to Carol and all the other gardeners present! Finally made my post. Great to see such good participation for the month of November! Thanks Carol!